Thornton Rust institute now proudly displays a public access defibrillator (PAD) box on the front of the building. And on Saturday, September 13, many residents attended the coffee morning in the institute to learn more about the defibrillator (defib) and how and when it could be accessed. Left: Ian White (right) and Dave Jones beside the PAD box outside Thornton Rust institute. Dave Jones, the community defibrillator officer for West Yorkshire, explained that the box containing the defib could be opened by obtaining the code for the keypad from the Yorkshire Ambulance Service. So, in an emergency, the first step was to ring 999 and the ambulance call handler will ask a series of questions to ascertain what was required. It is vitally important to give the ambulance service an address to which to send a fast response car, an ambulance and (if one was available) a community first responder. As a first responder I’ve often been very grateful that a Yorkshire Ambulance Service (YAS) fast response car has arrived soon after I have reached someone suffering from chest pains. But compared to administering chest compressions a patient’s chances of survival can be increased from below five per cent to over 50 per cent if a defib is used soon after someone has collapsed. So, if another person is available to help, they will be asked to run and get the defib, following the instructions provided by the ambulance call handler. When encouraging residents to make use of the defib Dave commented: “You can’t get it wrong – just have a go.” He said that the defib provided both spoken and visual advice on how to use it. Dave not only explained how the defib worked but also demonstrated how to give chest compressions using a dummy. Afterwards he had time to chat with residents and answer more questions while I, as member of the Carperby and Aysgarth volunteer community responder team, watched while some used the dummy to practise chest compressions. Practising chest compressions on ‘Little Anne’. The Carperby and Aysgarth team is short of members now and is finding it harder to provide almost 24/7 coverage in mid Wensleydale as we are willing to go beyond our four-mile radius. Ian White organised the installation of the defib box at Thornton Rust. 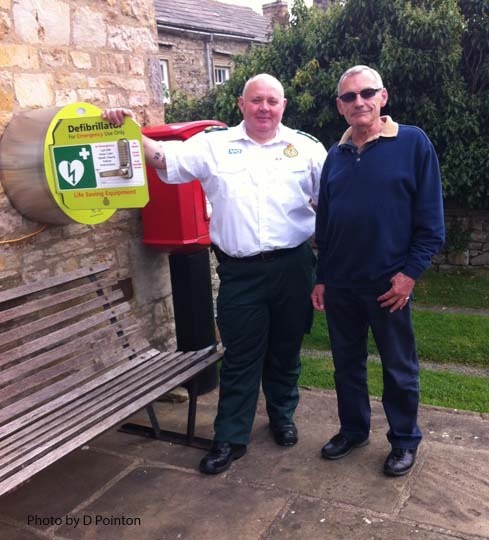 The boxes and defibs for Aysgarth and Thoralby have been deliverd and that for Aysgarth has been installed on the front wall of the village institute thanks to Kevin Hails and James Metcalfe. But, even though Thoralby was the first village in the Aysgarth and District parish council area to raise the funds for this equipment it is likely to be the last to have a box installed. Dave, however, said that having the defib box at the back of the hall was not a problem as the ambulance call handler would give clear directions as to its location and signs could be provided. When I asked him about this later he said that a PAD box had been installed on the back of another listed building in North Yorkshire. The box needs to be on a publicly funded building with an electricity supply as the defib must be kept warm during the winter months. The cost of the equipment at Thoralby and at Thornton Rust was met from the funding received through the Defra environmental stewardship schemes for Thoralby Moss and Thornton Mire. Aysgarth, as well as West Burton and Preston under Scar plus two villages in Swaledale received assistance from Richmondshire District Council’s Communities Opportunities Fund. I have read this with interest as I am just organising a defibrillator for Spennithorne. The village meeting has decided to go ahead , one or 2 people have already volunteered as first responders, we have the money and are planning to install in the redundant phone box which has an electricity supply. Please can you tell me who to contact for more information. 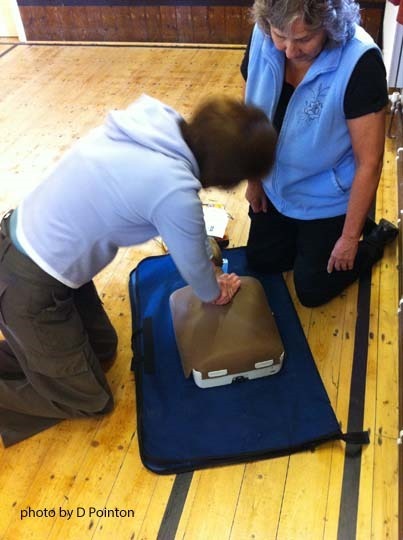 Just a quick bit of information sharing – for any parish which might be interested in funding a defibrillator – the project in Hunton successfully received grant support for theirs from RDC’s Community Opportunity Fund (COF). If any Parish is struggling to makeup a shortfall, this could be a place to look to purchase one of these vital bits of kit. We’re quickly approaching the end of the window for this year’s fund. Anyone looking for community funding support should speak to Samantha Coultish at RDC for more info. Great to hear there’s one coming to Spennithorne!